Announcing the arrival of new member of the family is an exciting and important time in anyone’s life. We encourage you to make the moment extra special by adding some sugar into the mix. Sweet Treat Supply has the best baby shower lollipop molds and chocolate molds for the special day at affordable prices. Our molds are perfect if you’re revealing your baby’s gender at the shower, we have molds that feature “baby girl” and “baby boy” on them, or even if you just want to brighten your table with cute candies. 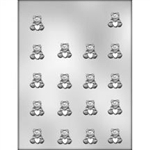 We worked hard to find the best quality baby shower candy molds so we could offer a wide selection of options for showers, announcement parties, and more. Some of our mold offerings include baby bottles, booties, baby carriage and ABC baby blocks. Sweet Treat Supply only offers molds from made from high-quality plastic and that are environmentally friendly. We’re confident that your baby shower will be extra special and sweet with our candy molds. Stock up on everything you need today and save with our free shipping on orders of $100 or more! Make baby themed candies or soaps using our wonderful selection of unique candy making plastic sheet molds.